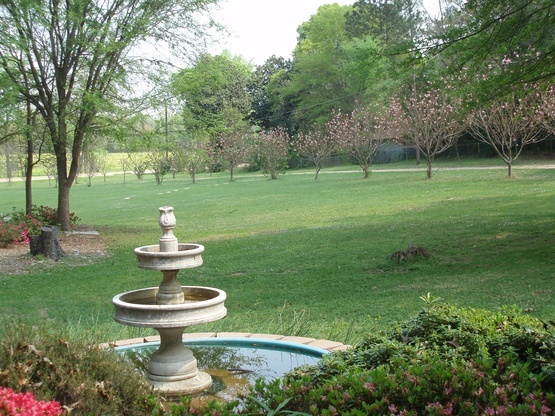 We live on a 3.75 acre plot and the way the property is situated we can host up to 10 rigs. 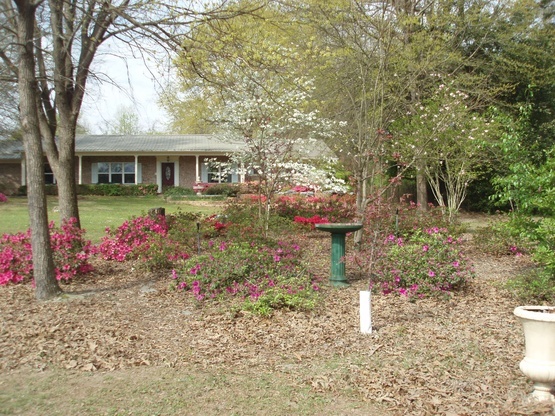 The sites will be by our house with 50amp/30 amp service and water and a dump site is also available. The sites will be approx. 400 ft. off State Hwy 8 South, 4 miles south of Interstate 30 (Exit 201), 20 miles west of Texarkana, Texas. We prefer that no alcohol or tobacco is used outside of the R.V. because of health reasons (smoke allergies). Pets are welcome. Gravel road to grass sites. *For health reasons we prefer that guest not smoke in the presence of the hosts. *We prefer that alcohol be used in moderation! * We are both retired therefore arrival and departure times and dates are not a problem. 400 feet from a state highway, on a gravel drive way. No problems known but if one is found we will address the issue. Behind or next to the rig. Sometimes the tow vehicle will need to be disconnected if there are other Boondockers Welcome guests already parked. There is plenty of room to park tow vehicles close to their rigs. We have sites available 24/7 so send us a message for a site to coordinate date. WE WELCOME GUESTS! Lakes within 10 miles-155 mile to Dallas- 155 miles to Little Rock Ar. Pioneer Days Festival and Rodeo in August each year. Trade Days Antique etc. booths and food booths held at Trailhead Park in New Boston, TX each month. 20 minute drive to Texarkana, TX on Interstate 30 for fine dining and theater attractions, and Texarkana Convention Center. One hour drive to Jefferson, Texas - a very scenic antique town. We had to arrive a day later due to weather issues. They are wondeeful host. Had a great evening talking with them. Be sure to see the Christmas Village they have built. A lot of work went into it. Highly recommend them. They were our first boondockers experience they were great!!! Treated Like one of the Family-Wonderful Stay! Perry, Ginny and Georgia are wonderful hosts. Their welcoming smile and gracious hospitality make you feel like you are family coming home for a visit. We arrived and got to relax for a few hours before supper. They give you privacy to set up and enjoy your surroundings. We had 3 bars of Verizon 4G without using our booster. We could get 13 channels on the TV using the standard RV Antenna. We walked around enjoying the gardens.before going inside and seeing the amazing model train set up inside the house. Ginny is a magnificent cook and we enjoyed supper immensely. Sitting around the table talking after dinner was so enjoyable, we hated to see the night end. 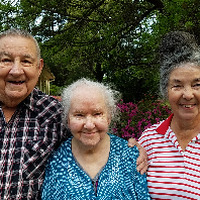 They are three really wonderful, fun people and we are so happy to have spent our first experience with Boon Dockers Welcome at their home. These hosts are absolutely wonderful. They offer a beautiful site surrounded by trees and lovely gardens with lots of area to walk your dogs (if you have them). But the best part of how welcome they make you feel. We were greeted so warmly as soon as we arrived. They showed us where the hook-ups were located and then left us to set up and relax. We were invited for supper and my goodness, it was absolutely delicious!! We felt like we'd known them for years...we chatted and exchanged RVing stories for hours. Georgia was a special treat...she'd sit quietly and then come out with a zinger! :) These folks are lovely...we highly recommend them as a host and hope to make it back to their area again in the future. What a wonderful experience meeting Perry, Ginny and Georgia! Such great people with wonderful personalities and giving hearts. We stayed two nights on their gorgeous property which proved to give us two nights of solid and quiet sleep. We were asked to stay for a supper of BBQ ribs, homemade potato salad, baked beans, creamed corn, and the best cream puffs we have ever eaten! Dinner was followed with lots of interesting stories , laughter and conversation until very late in the evening. We visited again our 2nd evening and talked even later that night! We left the next morning feeling like we were leaving our beloved family members. Ginny shared recipes home canned items and her love. Sweet Georgia, keep giving Perry a hard time...he loves it! Thank you Perry for all your help, stories and sharing your home. We hope to see you all again soon! We had a fabulous time with Perry, Ginny, and Georgia. After a tough day of driving west across Arkansas in driving rain, it was what we needed to have a beautiful dinner and some very spirited conversation lasting well into the evening. It is very obvious that they enjoy sharing their lovely home and if possible we are looking forward to spending another evening with them. We were greeted promptly when we pulled in and Perry & Ginny got us parked. We were invited in and shared a delicious Dinner and fellowship. Thank you for your great hospitality we really enjoyed our visit with you. Also their Christmas village Is one to be seen, the detail unbelievable. It was a pleasure to meet and make new friends. Hope to see them next trip south. 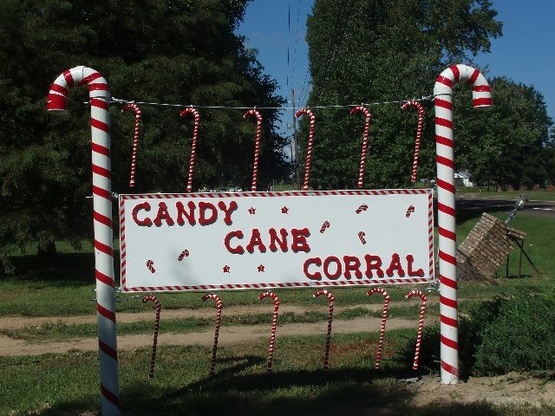 I would not hesitate for a second to plan my route to stay at Candy Cane Corral. This was our second stay at the Candy Cane Corral and once again, we are blown away by the kindness, generosity and warm-heartedness of our hosts. Not only that, but they have a beautiful property with all the amenities we could hope for! Perry, Ginny and Georgia welcomed us into their home as family, served us a delicious meal, and entertained us with stories of life and RV experiences. We can’t wait for our next visit! Great communication. Very friendly couple Perry and Ginny and mother in law Georgia. Made us dinner upon our arrival cause who wants to cook after driving so long. Yummy. Water electric and a dump area, not that we needed this but we did use it at one point. Good space for our 5th wheel and truck. You have got to see the Christmas village that they built in part of their house, it is a labor of love. So glad we stopped and were able to meet such wonderful friends. We stayed two nights at Candy Cane Corral. We were greeted by the friendliest couple who then invited us for dinner. Dinner was delicious and a treat! We will definitely return if we're ever passing through. Thank you for everything! We were welcomed with open arms at this stop in North Eastern Texas. Getting there is really easy and the setup is also easy with our 30 foot trailer in tow. We were welcomed to a nice meal and got to spend a lot of time chatting with the hosts. We were fortunate enough to catch the tail end of their X-mas decorations and it is was amazing. Definitely stop here if you are in the area. What a wonderful first boondockers welcome experience. Some of the kindest people we have had the pleasure of meeting. They go above and beyond to make you feel welcome. They even let the girls make mud pies in their yard><. We recommend this stop to anyone and everyone. Thank you very much Perry, Ginny, & Georgia! We look forward to seeing you again one of these days. THREE AWSOME, EXTREMELY INTERESTING & GRACIOUS HOSTS! Upon arrival we were pleasantly surprised by our hosts very gracious insistence that we use their water & 50 amp hookups even though we do have Solar. Also upon our departure our hosts invited us to use their dump station near the driveway exit. Then we were shocked by the awsome & very delicious homemade chicken Piccata dinner for which we were invited to join our terrific Hosts in their dining room. We were simply amazed & immediately knew that this three day visit was going to terrific! These hosts are very amazing & interesting and we do hope to return, especially during the holiday season when they will have their beautiful yard decorated as a Candy Cane Corral? A very sincere thank you to Perry, Ginny & the very interesting & young 94 yr. old Georgia. This was our second time staying with these wonderful hosts; they are more like family than just hosts. And we’ll be stopping in again next year along our summertime travels. A++. We had a wonderful time at our very first Boondoockers Welcome stay! Our Hosts are some of the kindest, most giving people we have ever met! They welcomed us with open arms and even prepared a delicious dinner for us when we arrived. 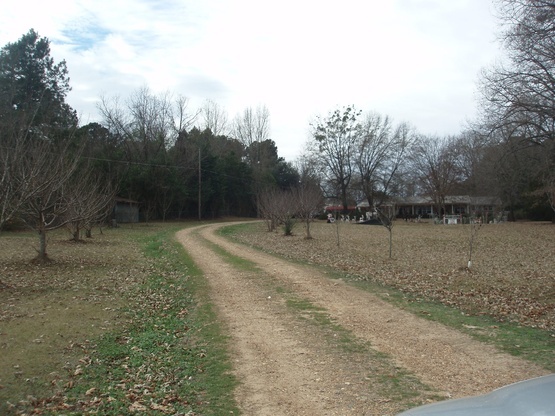 Their property is beautiful with plenty of room to turn into the driveway and turn around with our tow car. They offered us water, electric and even a place to dump! It was beyond our expectations. We have only been a part of the RV community for a short time but it is apparent that the people we meet are the best part of RVing. I believe God puts people in our path for a reason and I am so grateful that these three beautiful people were put in our path. As we drove away I really felt like we were waving goodbye to our family! Thank you again! My God continue to bless you each and every day! We are almost tempted to write a less glowing recommendation so we can keep them to ourselves, but anything less than an outstanding review would be doing Ginny, Perry & Georgia an incredible disservice. Even prior to our arrival, we were greeted warmly and welcomed into their home. In addition to full hookups, our hosts gave us an experience to not soon forget. Ginny is the most impeccable hostess and excellent cook. Perry and Georgia are as funny and quick-witted as they are welcoming and great conversationalists. P.S. If offered, a cream puff, do not even think about turning it down. What a pleasure to have stayed with this trio. They were courteous, friendly and funny. We were invited to a wonderful meal and a glimpse at the Christmas Village. Candy Cane Corral was easy to find, and amenities were just as advertised. Thanks, Perry, Ginny and Georgia for a wonderful stay. Thru Boondockers Welcome, I expected to meet some very kind and generous Hosts. And I have. However what I never expected to find was a Host family that is so kind and fun that I am planning another trip, just so I could go back and stay with them again. Candy Cane Corral is that kind of people. They are just really nice and kind people that invited us into their home and could not have been more gracious. I look forward to a trip back to Texas so we can stay with them again. No short title for these great folks. 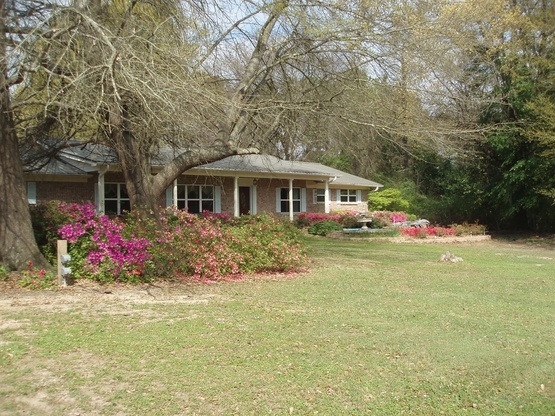 Beautiful property as well! This was my first time using Boondockers, this experience could not have been a better one. The Candy Cane Corral is easy to find. Parking is easy for any size rig and the hosts make you feel at home from the moment you arrive. If you visit ask to see their miniature Christmas village. They have put a lot of time into this and it is beyond belief. I promise if you see it your jaw will drop. We’ve hosted some 30 boondockers this past year at our place and we always thought we were great hosts... that is until we actually stayed at the Candy Cane Cirral with Perry, Ginny and Georgia. Talk about a wonderful stay and they will be on top of the conversation every time. Super easy to get there and nestled back off the road, their place is wonderful. And they have full hookups should you need, even a dump station. We chatted over dinner for a good couple of hours and loved every minute. Now we’re planning on staying with them again on our trip back home. Thanks again Perry, Ginny & Georgia for such grand hospitality and a great dinner with new friends. This was my second stay with Perry, Ginny, and Georgia after a one day break. Took a disastrous trip to Oklahoma resulting in my dog getting attacked, an all night drive to find emergency vet care, and getting covered in chigger bites. My dog and I needed a safe place to recover and regroup. I wasn't able to get an internet connection, but headed to Perry, Ginny, and Georgia's place because I knew they would allow me to park my RV without question. I was able to get a request to them in route and they were waiting for us in the driveway as we pulled in. Ginny even gave me a vile of homemade salve for my dog's wound and my chigger bites. They are truly caring and generous people. I'm fairly new to the RV life and my visit to Candy Cane Coral was my second Boondockers Welcome stay. Perry, Ginny, and Georgia totally spoiled me and will be the standard that I will reference at all future Boondockers Welcome stays. They went above and beyond in respects. 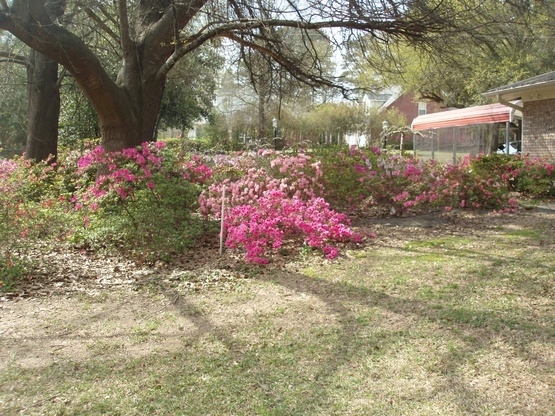 Their property is beautiful with plenty of space for multiple RVs. 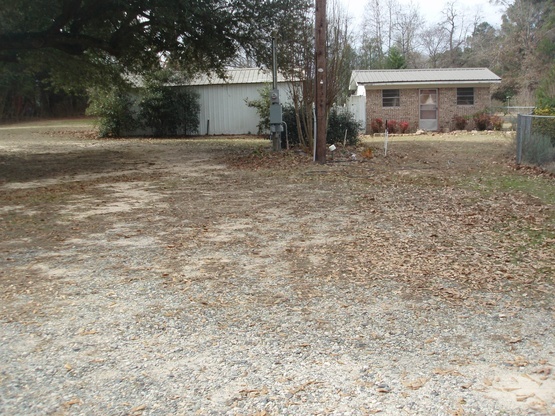 Lots of room available, far from traffic, for children and pets to play. During my stay, they had a large tree trimmed up allowing for RVs to do a pull-through. Perry, Ginny, and Georgia made me feel like part of their family. They even introduced me to the neighbors, who are also incredibly nice people. I did not want to leave. I really didn't know what to expect but got much more than I ever imagined when I stayed at the Candy Cane Corral. An acquaintance had set up the original stay so I arrived not knowing much what to expect. I found that they were exceptionally gracious, kind & loving hosts. I think I was smiling and/or laughing the entire time I was in their company. They provided a safe place for me to meet with a new friend that I only knew online. They gave us as much privacy as we wanted but also willing to share their fellowship and meals with us. I am new at driving an RV and they helped guide & encourage me as I parked. It was great that they shared tips and tricks about RV life too. I felt like a sponge soaking up their knowledge. The location was beautiful with a lake nearby and they freely gave us information about sites to see that they thought we might enjoy. The time and love they have put into their home and property shows, it was just a lovely and enjoyable stay. Their winter wonderland game room was an absolute delight to view with all the work they put into it. Just staying on their property alone was relaxing and beautiful in itself. My dog loved chasing the bunnies, squirrels and lightning bugs across their acreage. They made me feel like I was family and I enjoyed them so much. It was much more than I ever anticipated. They were a breath of fresh air. The love there is genuine and pure. Even their neighbors were friendly. It was so nice to feel so welcomed. I hope to make Candy Cane Corral a stop every year when I head out this way to visit my biological family. What a wonderful time we had. Best detour ever. We where treated like family. We would like to be adopted! Thank you Ginny, Perry and Momma. All the reviews were almost too good to believe. We can now say that the stay exceeded even the best review. Perry, Ginny & Georgia are true American Patriots. They are some of the most hospitable, gracious, caring and giving folks that we have met. Their Boondocking facilities include 50 amp electric, water and even a dump station! We parked under a 100 year old + tree with lots of shade. We were invited to dinner on arrival day and to a Mother's Day lunch on Sunday. Perry BBQ'd ribs that were super. Our dog Stella does not want to leave. She had the run of the property. Thank you, thank you for your hospitality. Perry, Ginny and Georgia are the BEST ever hosts. They treated me like family and traveling alone it meant a lot especially after several days on the road with sometimes harrowing weather. Their site is complete and so beautiful with mockingbirds providing morning serenades. I threatened to move in with them all! These folks are special, we will meet again. Thank you. What a WONDERFUL Host Family! We are so glad to have met Ginny, Perry, and Georgia too! We were welcomed warmly and enjoyed a delicious home-cooked meal around their table with other Boondockers Brad & Elaine. We hooked up to 50 amp service and parked under a HUGE oak tree. They invited us to stay for Easter Dinner the next day, but we needed to move on up the road. We really hope to meet them on the road someday or possibly when we are back in northeast TX and until them we wish them only the best and hope that they can get back on the road soon! Ginny and Perry were more than kind and generous. They went out of their way for us and made dinner for us when we arrived. We got there late, so it was extra special that they waited on us. Their Aspen village is fantastic and the kids went nuts for it. It felt like family to be with them. Highly, highly recommend this stop on the journey!!! We will visit again!!! Our stay at Candy Cane Corral with Ginny & Perry was absolutely exceptional!! They were fantastic host and immediately made us feel right at home. Upon parking our camper, we were welcomed to a delicious homemade meal which was a pleasure to share together. They were so sweet to our one year old daughter as well. She had a delightful time playing in their home! After spending the night with electric and water hook-ups, they generously invited us to join them for a nice hot breakfast. We all had a wonderful time, and wish we could have stayed longer! As we were getting ready to leave, they sent us off with a loaf of homemade banana bread and Tillamook cheese :) They truly went above and beyond in every way possible. We were both honored and privileged to be their guests!!! Ginny and Perry greeted us with smiling faces and dinner ready on the table. We were so glad meet them and learn about them and their interests. They have a beautiful level lot that was very easy to park on with water and electric. We felt very welcome and will definitely be giving them a call anytime we make our way through in the future. Imagine our surprise after pulling into our spacious, wooded campsite to be invited in for a wonderful dinner. It would be difficult to find more friendly and generous people. We enjoyed our overnight with Perry and Ginny and Ginny's mom immensely and plan to visit again. I want to add to my first comment. We joined Boondockers and were unaware of what we were getting into. We arrived at Perry and Ginny's place and drove up the tree lined driveway to a beautiful flat place to park under a magnificent tree and hooked up to 50 amp service. We got a very warm welcome from Perry and soon met Ginny as we viewed the most amazing display of Christmas decorations we have even seen. In no time we felt that there was a very special connection. they are HOST and HOSTESS extraordinaire. The house is set about an acre off the road so there was no noise from the traffic and believe it or not there was no railroad trains near by, giving us the most wonderful nights sleep. I believe that they have surpassed all expectations 100 fold. So much so, that we want to go back. We are forever grateful to them for such wonderful hospitality. We were wonderfully blessed to spend 5 amazing days with this family. Perry, Ginny and Georgia, have a very permanent place in our lives and we hope to get together again. Words cannot express how much they were there for us and there with us. It was our first Boondockers Welcome experience and we look forward to our next opportunity to meet more hosts. We had planned to stay 1 day...then 2 days...but because of the warm friendly welcome and the most wonderful time together, we did not want to leave. It felt like we were leaving family members. Perry, Ginny and Georgia are treasured friends for life. If you like meeting new, friendly people, I highly recommend these hosts. They were the best. I absolutely contact them again when passing through the area. Went to the dictionary and looked up "hospitality". They had a picture of Ginny and Perry! We reached out with short notice and were so lucky that they responded and we were able to stop. We've never felt more at home. They invited us over for a wonderful lunch and Ginny was nice enough to walk around with my 3 yr old and I. We saw baby bunnies, collected acorns, watched the fish swimming in the pond and enjoyed their magical winter wonderland set up. I'm sad we couldn't stay longer and join them for their famous rib dinner - maybe next time!! We highly recommend these wonderful hosts! We had plenty of space to park our 40-foot 5th wheel on their property. Ginny and Perry are very welcoming and hospitable; they made us feel right at home. While we were there, we enjoyed good conversation, story telling, and laughs which turned strangers into good friends. 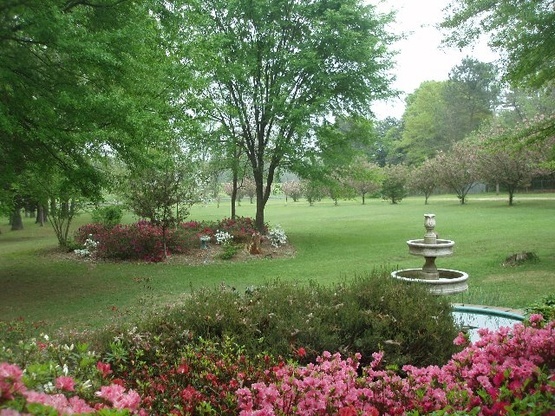 If you are in the Texarkana area, be sure and stay with Ginny and Perry. I know we will do so again. Perry and Ginny were the best hosts we have had with boondockers! They offered up a choice of three sites, one with full hookup. We stayed for three nights, and we feel they are some of the kindest folks on Gods earth. Best hosts ever!